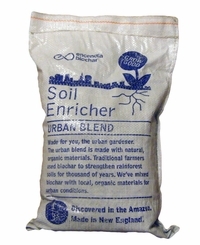 Home > Encendia Biochar - Urban Blend 1/3 cu. ft. This 9lb bag of is a blend of Biochar, Kelp Meal and compost. Add this blend to your pots, beds and window boxes. This blend is blended to help increase the water holding capabilities of your soil. It is recommended to apply about a half inch layer to your pots or raised bed. Gently mix the Biochar into the pots. An addition of Biochar to your soil will help your soil for many years to come.